What does it take to bring a totally new product to the US market? How do you go about sourcing the highest quality option for a single-ingredient product? How do you bring an ancient Indian practice to the US CPG industry? 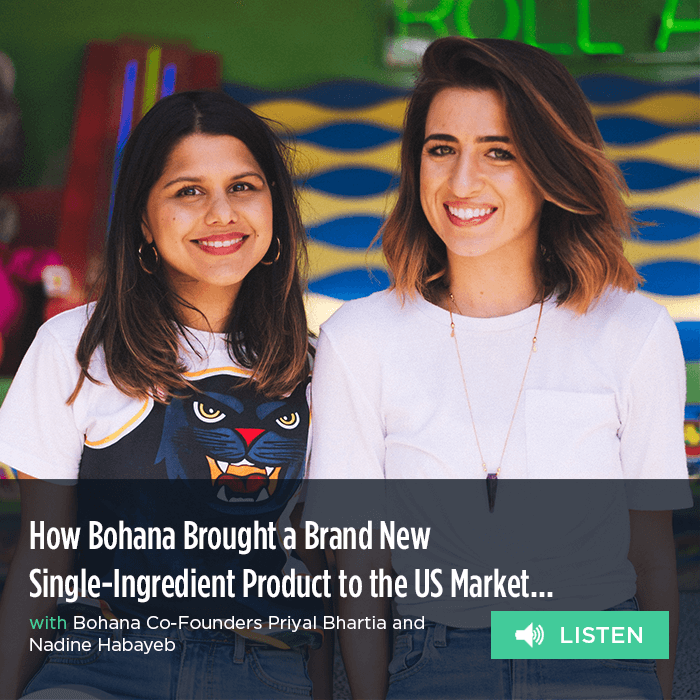 Even after just a couple months to market, Priyal Bhartia and Nadine Habayeb of Bohana have answered these questions with their newly launched snack: popped water lily seeds. Yes, that’s a thing – and we’ll tell all about how this dynamic duo is bringing this functional and delicious Indian ingredient to the States. Priyal and Nadine talk about all this and share some great lessons learned, including why they had to develop their own supply chain from scratch. Priyal fell in love with popped water lily seeds as a kid, recounting that she and her family used to eat them all the time as a staple in the Indian diet, and one of the only sanctioned foods that can be eaten during fasts. Years later, she shared some with her friend Nadine and they both knew they were onto something. During Nadine’s last couple of months in graduate school, the two tested the market by sharing water lily seeds with friends and classmates. After 6 months of market validation, the duo began the process of building their brand, starting with the sourcing of the seeds. After finding that the supply chain was hugely disorganized, they decided to cut out the middleman and go straight to the farmers, developing relationships that allowed them to source high-quality product, have confidence in their ability to scale and give more of the profits back. Priyal and Nadine join us this week and take us along their journey to market through an 18 month R&D phase. Best of luck on new product.